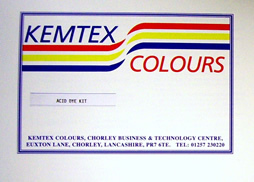 Welcome to Kemtex Educational Supplies we are suppliers of quality guaranteed, non toxic dyes and associated chemicals to Art / Design and Textile Departments at a wide range of Universities, Colleges and Schools, as well as to a diverse range of small businesses. Please note that all products and postage prices shown exclude VAT. Please add 20% VAT to your final postage and purchases, Thank you. Our products supplied include Procion, Disperse, Direct, Acid and Indigo Dyes, Manutex, Devoré and Discharge chemicals.These can be used for Textile Dyeing and Printing Applications as well as Colouration of Acrylic Jewellery. Popular methods of applying our products to both natural and synthetic fibres include: Dyeing, Screen printing, Hand printing, Batik, Devoré, Discharge printing, Hand painting and Transfer printing.